Flexpak has the ability to manufacture a number of different products to provide form fitting function to protect a palletized product. Covers can be designed for specific shapes and forms while considering functionality in pallet cover design. Shrinking possibilities are unlimited with the use of poly sheeting based products. Tightening the pallet cover can be completed by the extrusion properties in the plastics, and form fitting pallet covers can be designed to shrink in multiple directions. Shrinking film is determined by the extrusion process. Once the type of shrink and tightening aspects have been identified, Flexpak can design a pallet cover to match the specifications. Hot air is used to shrink the plastics in different directions, and can be applied by automated machine or by hand gun. The best use for this application is with high value products or products that may need to be “locked” into place with the form fitting shrinking properties in the pallet cover. Hybrid designs are possible with this type of cover. Customizing a pallet cover to fit specific pallet specifications is where Flexpak excels. 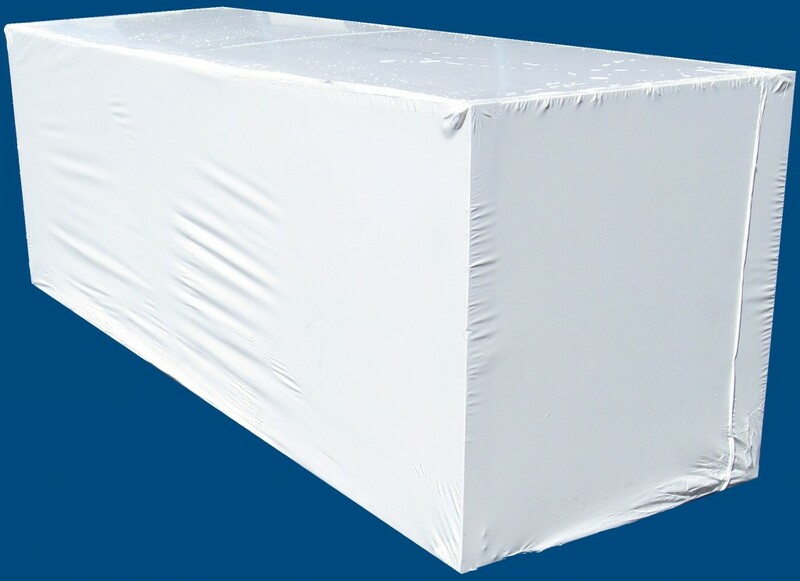 Contact Flexpak today to discuss the possibilities of a Form Fitting Pallet Cover.